The Swedish–Norwegian region, as defined in the project, spans the northernmost section of the 1630 km long Swe- dish–Norwegian border. It includes the Swedish towns and municipalities of Gällivare and Kiruna, and the region of Ofo- ten with the town of Narvik on the Norwegian side of the bor- der (see map 2). The region is sparsely populated, with 70 000 people living within an area of 42 000 square km (the size of Denmark). Rough mountainous terrain separates the Norwegian and Swedish parts of the region from each oth- er. The only cross-border connections are a road (European route E10) and a railway (the Iron Ore Line). Mining is the principal economic activity in the region. Iron ore (90% of the EU’s total production) is extracted on the Swedish side and transported across the border to the warm-water, deep-sea port of Narvik, from where it is shipped to the world market. The conditions for CBC in the Swedish–Norwegian region are generally very good. As such, the region stands out as rather exceptional compared with the other cases studied in the EUBORDERREGIONS project. First, the Swedish–Norwegian border is open, and has been so for a long time. Already in 1959, Norway and Sweden signed a customs co- operation agreement aimed at facilitating border crossing, simplifying customs controls and clearance procedures. Since 2001, both countries have been members of the Schengen Area. In comparison, the other CBRs are divided by hard borders that restrict the flow of people and goods and hamper cross-border integration. Visas are typically required by both sides and the actual crossing of the borders tends to be an ardu- ous and time-consuming procedure. Second, the Swedish–Norwegian region is marked by economic par- ity, with the two sides of the border enjoying similar economic prosper- ity. CBC may therefore take place on an equal basis. The other cases are characterized by a considerable economic disparity between the EU side and the non-EU side of the border. In most of these cases, the GDP per capita is more than three times higher on the EU side. Such asymmetry tends to affect CBC in a negative way. Third, the external borders of the EU are often deep borders, marked by cultural divisions and nationalistic sentiments. Linguistic differences often pose a practical challenge to cross-border integration. Another obstacle is the existence of antagonistic attitudes due to past conflicts. Here too, the Swedish–Norwegian case represents an exception. There are no significant cultural barriers between Norwegians and Swedes and no historical grievances hampering CBC. Along the northernmost sec- tion of the Swedish–Norwegian border, culture and history even serve to unite the two sides. First, a sizeable ethnic minority, the Sámi, have traditionally lived on both sides of the border. Second, the two sides share a common industrial history and identity. The towns of Kiruna and Narvik owe their very existence to the development of mining and the Iron Ore Line in the late nineteenth century. Rallarkulturen (navvy culture), mining and railway heritage, is displayed and celebrated all over the region. In most cases, the border between the EU and its neighbouring countries functions as both a bridge and as a barrier. In some ways, the border encourages CBC; in other ways, it obstructs it. However, in the Swedish–Norwegian case, the border is hardly a barrier at all. Respond- ents in the region refer to the proximity of the border as something sole- ly positive. Negative factors related to border proximity elsewhere, such as crime, illegal migration, non-equal relations and unfair competition, are barely mentioned. CBC in itself tends to be valued as something en- tirely positive, progressive and productive. Industry is a key field for economic CBC in the region. The cross-border network formed by the extraction, transport and export of iron ore con- stitutes an economically symbiotic relationship between the two sides of the border. The Swedish mines depend on the Norwegian port and vice versa. Industrial CBC involves the large Swedish state-owned mining company LKAB as well as numerous other smaller actors on both sides of the border. The industrial CBC is largely unproblematic and self-pro- pelled. There is, however, a need for an improved cross-border infra- structure as the demand for minerals is expected to increase in the com- ing years. The duplication of the railway between Kiruna and Narvik has been proposed as one way to increase cross-border transport capacity. Much CBC within the region takes place within the framework of shared Sámi culture and heritage. The co-operation between the munic- ipalities of Tysfjord (Norway) and Gällivare (Sweden) is one example. Since 1999, the two municipalities, together with local Sámi commu- nities and organizations, have joined forces in several Interreg projects aimed at strengthening cross-border integration. One of the outcomes of these projects has been the establishment of the Border Trail (Sámi: Rádjebálges, Swedish: Gränsleden, Norwegian: Grenseleden), a cross- border heritage trail that offers locals and visitors an insight into the rich culture and nature of the region. Unique for the Swedish–Norwegian region is the constructive role played by the municipal business development companies in regional CBC. The development companies of Futurum (Narvik), Progressum (Kiruna) and Expandum (Gällivare) have collaborated across borders for a number of years, often together with other public and private part- ners. The companies have defined CBC as an important dimension of regional development. Three years ago, they jointly established the East West Arena, an annual conference that has become the main platform for discussing CBC-related issues and developing CBC links in the region. Figure 1. 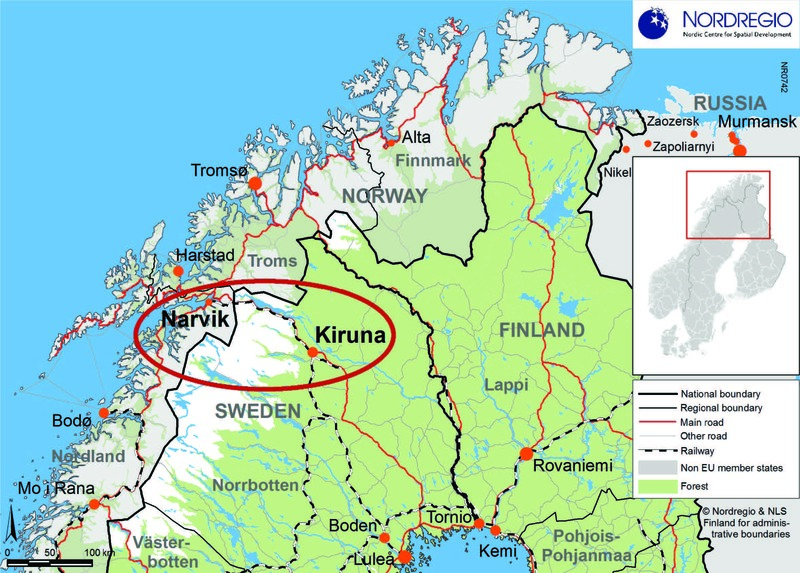 The cross-border region of Kiruna-Narvik. While industry will remain the most important field for economic CBC in the region, there is also great potential for developing CBC within other sectors. Tourism is habitually referred to in this context. Both sides of the border attract a considerable number of tourists but are largely independent of each other. Norwegian as well as Swedish respondents therefore point to the possibility of creating cross-border tourist pack- ages. The idea is to capitalize on the great natural variety in the wider cross-border area from the Lofoten Islands to the Bothnian Bay. Co- operation within the field of space research and expertise exchange be- tween the Norwegian petroleum sector and the Swedish mining sector are also mentioned as fruitful fields for future co-operation. The Swedish–Norwegian CBR, characterized by a high degree of openness, parity and unity, offers unique conditions for CBC. The further development of CBC in this region is not so much about breaking down barriers as about exploiting the opportunities that already exist. To improve CBC further in the region, general awareness of these op- portunities needs to be raised. There is also a need for more meeting points where organizations from both sides can get together. The estab- lishment of the East West Arena is an important step in the right direc- tion and the recent popularity of the event (180 participants in 2014) demonstrates its importance.